With glasses of wine and bags of popcorn in hand, the audience in the Vancouver International Film Centre on March 11 were prepared to watch The Shadow of Gold, a documentary by Denis Delestrac, Robert Lang, and Sally Blake. The documentary explores the tragic stories of people whose lives have been affected by the gold mining industry. It also examines the industry’s environmental impacts. Through industrial mining, enormous expanses of land are upturned and destroyed with the promise of gold lying beneath the surface. 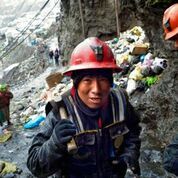 Small scale artisan miners use toxic mercury to concentrate the gold they find, but both scales and processes involve huge amounts of waste and destruction. The industry is not a new one, but the price of gold has risen 3,000 per cent since the 1970s, causing a flash “gold rush” that has swept the world off its feet. The gold frenzy spans from here in B.C. all the way to China, and the promise of gold leads companies, businesses, and government to overlook the huge impacts that mining has on the environment. In the early hours of August 4, 2014, one of the biggest environmental disasters in Canadian history took place. The dam to the tailings pond for Mount Polley’s open pit copper and gold mine broke, releasing years’ worth of mining waste into Polley Lake. The waste made its way through Hazeltine Creek and Quesnel Lake through to the Cariboo river, which eventually joins the Fraser. The film’s post-showing panel featured personnel Jacinda Mack, who was and still is deeply affected by the Polley disaster. Mack is from Bella Coola, a member of the Secwepemc and Nuxalk Nations, and a leader for Indigenous women advocating for responsible mining. She says that the disaster was “a defining moment” for her, her Nation, “and all those who depend on the Fraser watershed,” which runs from Vancouver through the Fraser Valley and past Harrison Hot Springs. “We live in a waste culture where things are just thrown away. Well, it doesn’t just go away, it goes somewhere,” Mack told listeners at the event. The effects of the Polley disaster are still seen in the watershed today. Many communities, including the Kwantlen Nation, depend on the waters for fishing and making medicine. The negative impacts of the dam disaster have caused irreversible damage to local waters, yet the Polley Dam is back in operation as it had been before. With emotion heavy in her voice, Mack says that “it’s not a matter of if [but] a question of when” the next disaster strikes. By seeking to recycle gold or work with jewellers that ethically source it, we can take the first steps as individuals to help change the harmful elements of the industry. For more information or to donate to the cause visit theshadowofgold.com. The film is also available for streaming at https://www.tvo.org/programs/the-shadow-of-gold.